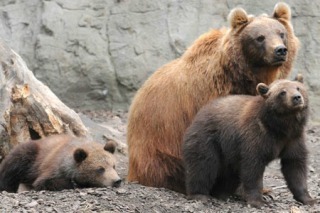 Bears on the watch: image via frumforum.comA woman watching the bears at the Rosamond Gifford Zoo in Syracuse, NY last Friday suddenly became the watched one as she went into labor and gave birth to a baby girl right on the Zoo's main path. What could the bears do? Which is what several of the zoo-goers were doing, stopping on the path to watch the woman, who had not much notice, give birth to a baby girl while zoo employees tried to shoo the gawkers away and keep the new mom and her baby warm with clothing and blankets. In the meantime, a family member of the new mom called for an ambulance, and the county's Rural Metro dispatch supervisor provided directions to the zoo staff over the phone as the 21-year-old woman gave birth. Once the ambulance arrived, mom and baby were taken to Crouse Hospital. Zoo Director Ted Fox told the Syracuse Post Standard that this year had seen a bumper crop of animal babies too. You Know This Cat is Planning an Evil Deed -- The Animal Video of the Day!! !